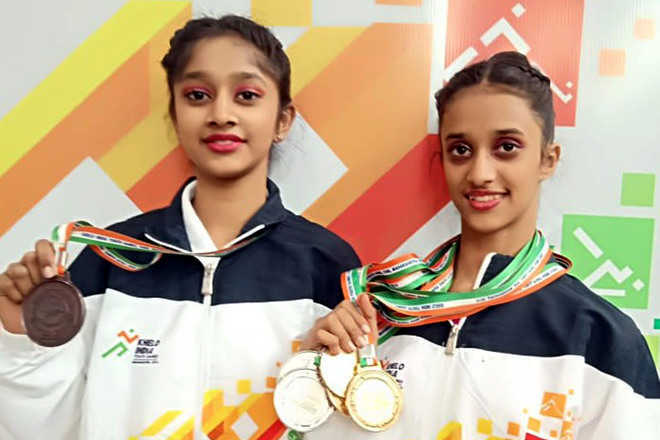 Already on cloud nine after winning six medals, including three gold, two silver and one bronze at the ‘Khelo India Youth Games-2019’ held in Pune this year, ace gymnasts Bavleen Kaur and Vandhana now want to prove their worth at the international level. Both gymnasts started the year on a high with outstanding performances in the prestigious event. Bavleen bagged three gold and two silver medals in the under-17 women’s category of rhythmic gymnastics. Vandhana managed to clinch a bronze medal in the same event. While Bavleen has been born and brought up in Jammu,Vandhana, whose full name is Vandhana Barathi Balamurugan, originally hails from Chennai but is studying at the winter capital besides attending practice sessions at MA Stadium under the guidance of coaches SP Singh and Krupali Singh. Both gymnasts appealed to the state to provide requisite infrastructural facilities to all sportspersons irrespective of which game they play. “We are not saying that only gymnastics players be provided all facilities. Every player needs them in order to hone his/her skills. We have been promised by the sports council authorities that adequate space will be provided to us for practice,” Bavleen and Vandhana said. Sharing their experiences with The Tribune, the duo spoke about their game and future plans. “Like any sportsperson, my foremost aim is to represent my country in any international championship. Be it Commonwealth Games or Olympics, it hardly matters,” Bavleen said. Daughter of a civil engineer from Chennai, Vandhana came to Jammu for attending gymnastics practice sessions but then decided to pursue her studies and game from the same place. “I stayed with dad till I was 5. After that, I returned to India in 2013 and started practising gymnastics. It was only through my coach from Tamil Nadu that I came to know about Krupali ma’am and SP Sir. I decided to attend training sessions under their guidance,” Vandhana, a student of Heritage School, said.